Nepalgunj is one of the developed cities at Banke District of Nepal. Along with transportation and industries it is also popular hub for medical services. Bustling with a number of vehicles, Dhamboji is the center of the city. It is also called as "The heart of the city" as remains to be a busy area. As for traveling in Nepalgunj, you may not find much places. There is a very popular Hindu temple known as Bageshwori Temple. However, Nepalgunj is the perfect gateway to several conspicuous travel destinations. The nearest locations you can visit from Nepalgunj are Kohalpur, Surkhet and Karnali River. It is the famous gateway to Kailash Mansarovar. Bardia National Park, Karnali River, Rara Lake, Rara National Park, Phoksundo Lake which are some of the astonishing sites you can access from Nepalgunj. Furthermore, Nepalgunj is also connected with the border town of Uttar Pradesh in India. The two major cities of India; Lucknow and Kanpur can be easily reached from Nepalgunj. It is around a 5 hours drive to Lucknow and 6 hours drive to Kanpur. 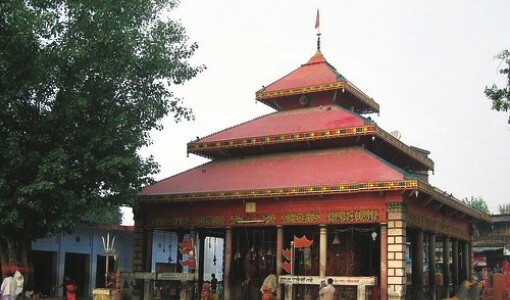 As a popular Hindu temple, Bageshwori Temple is an iconic temple of Nepalgunj. Situated at t he center of city, it is dedicated to Goddess Bageshwori. Hindu devotees from different places come to pay their reverence to the goddess. Moreover, the area of the temple has a pond where Lord Shiva with a moustache is standing at the center of it. The kind of Shiva statute is one of a kind in Nepal. The temple usually gets crowded during the festival like Dashain, Teej, Shiv Ratri and Magh Sukla Purnima. You should also visit the very old section of Nepalgunj called as grass cutter's lane. The caste known as "grasscutters" used to belong here. The country life of Nepal is well depicted so do not miss the opportunity to experience the traditional life of rural Nepal. One of the best things about travelling to a place is to try its specific food. Nepalgunj is famous for mouthwatering sekuwa (roasted spiced-meat). Other snacks such as samosas (fried pastry stuffed with potatoes, onions, peas, etc), chaat (a mixture of puffed rice, boiled potatoes, chopped onions, lemon juice, spices, etc), Katti Roll, Ravadi (a milk sweet) and Golgappas (also called pani puris, which are small fried pastry balls served with a spicy filling dipped in spiced water) are also popular. Due to their unique spices and cooking style, they are considered to be the delicious and enjoyed all over Nepal. Bardia National Park is just an hour drive from Nepalgunj. It is another frequent visiting spot for wildlife exploration. Popular for This wildlife rich park boasts of 839 species of flora and you can see one of the several Gharial or Mugger crocodiles that inhabit the rivers. The national park is renowned for its conservation efforts, which you will see when you visit the crocodile and elephant breeding centers. If you are lucky you can see endangered species like Royal Bengal Tiger, One Horned Rhinoceros, Barasinghas, Langur Monkeys, etc. Drive around 3 hours from Nepalgunj to a nearby city called Surkhet. There are many destinations to visit at Surkhet like Kakrebihar, Bulbule Taal and Deuti Bajai. Kakrebihar is located inside a forest. There are two lakes found here each worshipped by Buddhists and Hindus. 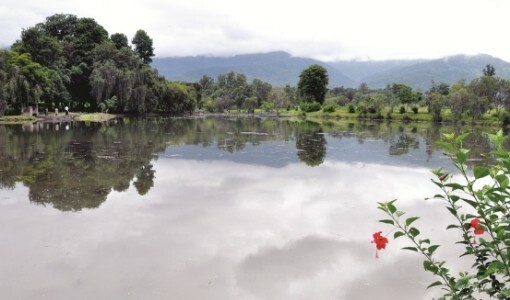 The smaller pond has water bubbling from the underground, hence called Bulbule Taal translated to Bubbling Lake. You can enjoy boating on the bigger pond. The Deuti Bajai is another holy site where people believe that worshipping it fulfill their wishes. Pilgrims from around the world travel to Mt. Kailash and Lake Mansarovar through Nepalgunj because it acts as the best gateway. Mt. 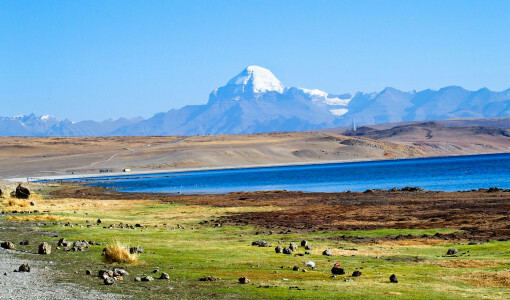 Kailash and Lake Mansarovar are the two holy, spiritual and religiously significant sites. It is known for its religious values and holds cultural importance to Hindus, Buddhist and Jains. Referred to as the center of the world, Kailash mountain is sacred and therefore, people are not allowed to climb to its summit. In Hindu mythology, it has been mentioned as an abode of Lord Shiva. Lake Mansarovar is situated at the base of the Mt. Kailash. It is Tibet’s holiest lake, and is about 30 km away from Mt. Kailash. Tikapur Park, Dolpo district and Karnali River are some of the prominent sites you should not miss. Further, a number of national parks such as Shey Phoksundo National Park, Khaptad National Park, Banke National Park, Shuklaphanta National Park and Rara National Park can be explored from Nepalgunj. 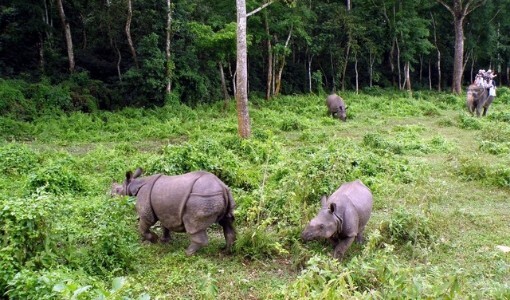 Go on a jungle safari in any of the National Park to explore the natural beauty and wildlife of Nepal. An elephant ride gives you a different perspective of wildlife. The mahout carefully guides the elephant into the dense jungle. A jeep safari has the advantage of being more comfortable than sitting on the elephant, and covering more ground. Exhilarate your senses as you take a jungle walk, keeping your eyes peered and walking as lightly as possible to not disturb the wildlife. All these activities provide you opportunities to see the species of flora and faunas and various endangered species. Located near Bardia National Park, do not miss the chance to see the traditional customs and rituals of the Tharus (an ethnic group) at the Tharu Cultural Museum. The small Tharu Cultural Museum brings to light the unique customs and rituals of the Tharus. The museum houses various earthen artefacts that were used to store grains, traditional clothes worn, musical instruments played, and other traditional apparatuses that were used for food preparation. Trek to Api Base Camp standing at 7132m. It is the highest mountain in the far western region of Nepal. It offers splendid views of Api mountain, beautiful Mahakali Valley, steep gorges, subtropical to alpine forest and vegetation, pastures, grasslands, waterfalls and lakes. Karnali Bridge is a single tower bridge connecting Kailali and Bardia districts of Nepal. Karnali River has one of the finest stretches of white water in the world. It is the perfect location to carry out thrilling aquatic adventures of rafting and kayaking. Babai River is one of the interesting and enjoyable spot for fishing. The river flowing from the heart of Bardia National park is also favorable for rafting. Nepalgunj is a city with people of diverse cultures. Hinduism and Islam are two major religions with Hindus holding the larger population. The rest of the people are Brahmins, Newars, and Magars. People speak Nepali and the respective ethnic groups speak their mother tongue. As in several parts of Nepal, Nepalgunj also celebrates tons of festivals throughout the year. Dashain, Tihar, Holi, Shiv Ratri and Magh Sukla Purnima are celebrated joyfully. Nepalgunj Airport is the airport serving Nepalgunj. 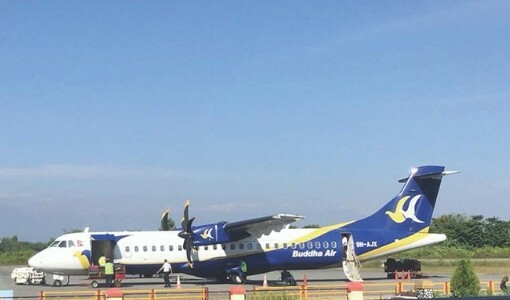 Buddha Air has daily and direct flights from Nepalgunj to Kathmandu. The duration of Nepalgunj to Kathmandu flight is around 50 minutes. A trip to Nepalgunj is unlike any other you will experience in Nepal. It will be an unforgettable tour that will give you amazing religious and adventure experiences.